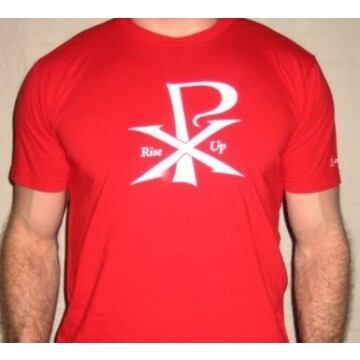 Red Shirt with White Symbol Symbol: The "X" (Chi) and "P" (Rho) are the first two letters of "Christ" in Greek, thus a symbol representing Christ himself. Symbol History: Though the symbol dates to the earliest years of Christianity, the popularity of the symbol was spread by Constantine the Great. Though not a Christian at the time, Constantine prayed one night that God might assist him in his battles with his enemies. Soon after, a vision of this symbol appeared to him with the inscription "BY THIS SIGN, YE SHALL CONQUER." As the writer Eusebius describes it: "the symbol of the Saviour's name, two letters indicating the name of Christ by means of its initial characters, the letter P being intersected by X in its centre" Upon conquering Rome, Constantine issued the Edict of Milan in 313 A.D., outlawing the persecution of Christians and ordering the return of all previously confiscated properties. 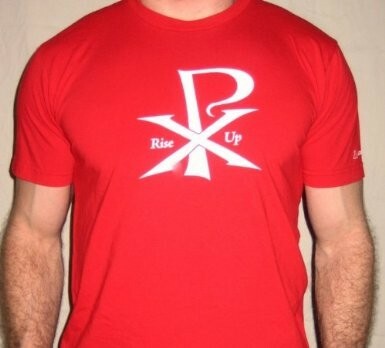 Scripture Passage: The phrase "Rise Up" is taken from the Acts of the Apostles 22:16 "Rise up, and be baptized, and wash away thy sins, invoking His name."